Pedicabs in Downtown and the surronding area? Image via WikipediaHere is an article from Xing Columbus and a link to a more thorough article talking about the use of Pedicabs in the downtown Columbus, Ohio area. When most people think of Pedicabs Japan and China come to mine as big user of Pedicabs. However, pedicabs are slowly being accepted in certain areas around the country. So how about pedicabs in Salt Lake City? With our wide streets Pedicabs would be able to be in the curb lane while automobiles could use the other lanes. The big benefit of pedicabs is that they are cleaner since they do not have motors plus they offer a unique travel experience. However, some people don't like the Pedicabs especially the automobile cab industry who usually fight against pedicabs including a vicious fight going on in Los Angeles. In New York pedicabs have become too successful and many groups are trying to get them restricted to benefit of the Pedicab opponents. Pedicabs would make getting around downtown that much easier plus offer a unique Asian influence to the area. Say you just have a nice dinner at one of our nicer independently owned restaurants, you could use one of the pedicabs to get you a the couple of blocks over to the nearest light rail station. Pedicabs, a another possible piece of our transportation puzzle. Image via WikipediaYou know that old tired argument that certain people who shall remain nameless because they should always use about rail transit being outdated because it is 19th Century technology? Since there have been so many serious postings lately, I thought it was time to lighten up the mood and here is some great information to the people that use that outdated technology bogus argument. 1879: Karl Benz patents the two stroke engine. 1823: First internal combustion engine is patented. Around 1769: The first horseless carriage is developed. That's right the automobile dates back all the way to the 18th Century!! So there it is folks. The next time you hear someone throws that old tired argument that streetcars are outdated technology, you can ask them if automobiles should be thrown out too because they are OLDER technology. Image via WikipediaA few articles of note from todays media including articles about the BRT line on 3500 South, an historical article about rail transit in Utah County and a land owner that is not happy with the offer he is getting for his land. First the article about the so-called bus rapid transit line along 3500 South. There has already been delays to the start up of the service due to problems from the manufacturer Van Hool. Van Hool buses are already being used in Oakland by AC Transit and VIVA an agency outside of Toronto. Hopefully UTA will have better luck than those agencies have had in maintaining a bus that is largely going to be an orphan of the fleet. UTA is claiming a 15-minute savings over the regular route 35, however probably a third of more of that can be directly contributed to not making the UTA Headquarters jog that the current 35 makes. It seems that most of the BRT propaganda includes the byline that BRT is just like light rail but only cheaper. However, it should be noted that the cost of BRT is only cheaper if you are not comparing equal systems. However, if you attempt to build a BRT line with the same carrying capacity of Light Rail, your true capital cost would be higher, and you would have to add additional operating cost since Light Rail can carry more people at a lesser cost per passenger. Ridership numbers will be interesting to watch. Their current estimates of 1500 is about 50% more than the old 37, now 35 did going back many years. 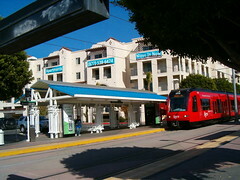 However, the best that BRT has seemed to do is attract about 13% new riders to transit and that was create new dynamics such as the case of Los Angele's route 720 that combined the Wilshire Line and the Whittier Blvd line into one market thus giving a one seat ride that didn't currently exist. This is a really nice article showing the early history of rail transit from Utah County to Salt Lake City. Finally there is this article from FOX 13. This is one of those situations that you can see both sides of issue and want to see a fair ending. My guess is the real answer is probably somewhere in the middle. After all most people think what they own is worth more than it actually is. How many people go into car lots to get rid of their car and think it is worth so much more than it actually is? I guess we come attached to something and it takes on more value than reality. Sorry I haven't posted for a week by last Thursday (15th) was my wife and I's 10th Anniversary so we took a little trip through Colorado, New Mexico, and Arizona to celebrate. 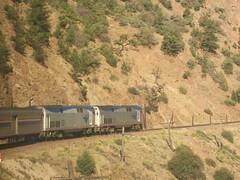 We had the opportunity to ride the famous Durango and Silverton train between those respective towns which was a contrast from Amtrak's Superliners, the Cascade Talgo, and FrontRunner. Also, for anyone that still wants proof that turning UTA over to UDOT is a bad idea and could lead to transit funds being stolen for other projects, the Governor of California, you know that actor guy has proposed taking $1 Billion of voter approved moneys and moving into the general fund and then sending some of that funding over to highways. Does anyone really want to give our state legislature that opportunity? 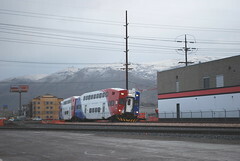 Did UTA pull a bait and switch in West Jordan? UTA has ordered 77 new light rail cars for the expansion of the system that will be taking place over the next few years. Unlike the previous cars that UTA ordered from Siemens which were SD100 and SD160 models, these new cars will be the S70 low floor model as the one pictured here from San Diego. San Diego currently uses these cars on their Green line which travels from Old Town out to Santee. Unfortunately I never had the chance to ride one and try them out since every time I hopped the train it was a set of older cars. Last time I talked briefly about how Ogden could create a nice urban area by putting together the streetcar, a revitalized Washington Blvd, and the Centennial Trail that goes along the Ogden River. Today I was planning to go into a little more detail and build upon those previous ideas. First of all, the streetcar line will create a new corridor from the FrontRunner Station to WSU. As has been seen in Portland and Tacoma, streetcar lines have the habit of bringing new interest to a community. Then you have the Centennial Trail along the Ogden River that travels from the Twenty-First Street Pond which in itself has a trail system to the Bonneville Shoreline train that offers even longer trails. As you can see on the map you have four main streets that connect the streetcar line and the trail system. Turn all four of those streets into pedestrian, bicycle, and transit friendly streets. 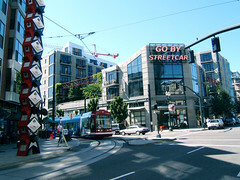 Now you have created four different corridors to connect the streetcar line to the trail system. Wall Street is currently in the doldrums but using Wall to connect the FrontRunner Station to the trail system would offer new opportunities to revitalize this street. Meanwhile we have our diamond in the ruff Washington Blvd. Currently there is a lot of independent businesses along this corridor including a lot of older motels. One of the problems when an area is revitalized is often gentrification comes into play and many of the smaller independently owned businesses are forced out and the chains move in. Yet this would ruin some of the opportunities that Ogden would have to set itself apart from its neighbors to the south. One way to prevent this is to promote the restoration of some of the older buildings; giving tax incentives to restore instead of bulldoze which overcome the federal tax laws that encourage bulldozing and building new disposable buildings. 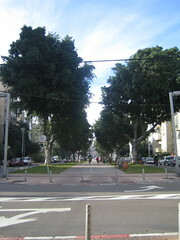 Imagine a street of beautiful motels and restaurants that are not a bunch of cookie cutter boxes. Meanwhile Monroe and Harrison are primarily residential streets with small pockets of neighborhood business so making those streets pedestrian/bicycle/transit friendly would be neighborhood improvements that could lead to reinvestment into the area. This would allow Ogden to set itself apart from its neighbors and give itself its own marketing niche. Ogden could promote its own uniqueness and give new reasons to come to Ogden. For those of you who did not know it, today is national train day, a day to celebrate our national rail passenger system. Of course those of use here in Utah were we have only one train per day that comes through in both directions at night, there is not much to celebrate and since Utah does not help Amtrak fund a state operation we seemed to get ignored like many other places. In fact, Amtrak passed its 37th birthday on May 1st; I would scarcely call it a celebration since there is little to celebrate. I guess we can celebrate that we do have some semblance of a rail passenger network in place sense the creation of Amtrak was designed to shut down rail passenger service, not make it survive. Personally, I support long distance rail passenger service. In the past year I have taken a couple of trips over to Denver on the California Zephyr, plus my wife and I have traveled up to Portland, Seattle and Spokane on the Coast Starlight, Cascade Service, and the Empire Builder respectively. However, while Amtrak seemed to make progress in its first 10 years especially redoing the run down fleet in found itself with, there has been little progress when it comes to rail passenger service the Carter Administration cut many trains out. Today, the system is in worse shape for the most part than when Amtrak first started on May 1st, 1971. In fact the only success stories you find is were the states have funded improvements having to bring Amtrak along kicking and screaming. Rail Passenger service can be a success in spite of Amtrak not because if it. Here is some articles that may be of interest including one I wrote a few years ago comparing Amtrak to K-Mart. Does Amtrak Have Too Much in Common with K-Mart? What Do We Need From Amtrak? This episode of Perils for Pedestrians features information from what is happening in Toronto, Ontario. One of the features of the video is talking about GO Transit which has recently celebrated its 30th anniversary. If you look at the picture you will see a ten car train of Bombardier cars similar to the ones now in service on FrontRunner. Consider that this single train can carry 1200 passengers and they are at capacity. The picture also includes one of GO's new MP40 locomotives. While similar to the ones bought by UTA, these have a higher horsepower rating so that they can run 12 car trains with a capacity of 1440 SEATED passengers. Apparently Mayor Godfrey up in Ogden is still dreaming of that wonderful urban gondola project instead of looking at what the best transportation options for the city is. Now let’s take a look at the Gondola comparison prepared by the city of Ogden. The first thing you will notice is that the only project that has been built that even comes close to what Godfrey wants is down in Columbia. Other than that all the other urban gondola projects are pipe dreams. One thing that is not mentioned anywhere in the comparison is what happens to the urban fabric between the gondola stations. The first gondola mentioned is the Roosevelt Island Gondola in New York City. This was built before Roosevelt Island had a subway station which opened in 1989. One thing to note is the ridership. Our two TRAX lines carry the same number of passengers in less than two years than the Roosevelt Island gondola has in its 30 years of existence. Also there is no comparison to the urban fabric since the Roosevelt Island gondola primarily travels over the East River. The next gondola project talked about was MART which was part of the New Orleans Worlds Fair. This is another gondola that traveled over water so had no effect on the urban fabric it passed over. An interesting point about this gondola is that there was plans to continue operating it after the fair but that last less than six months and was later torn down on the orders of the Coast Guard. Another interesting facet is that ridership during the fair boom was less than half of what projected by the backers of the system. The next one compared is Telluride Colorado which travels from the historic city to the Mountain Village area. 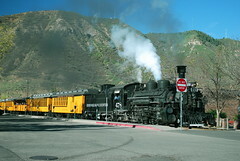 Once again it is hard to compare as this one is designed to carry people from the historic town which is located in a narrow valley up to the village which sits 1800 feet higher than the historic village. Once again there is no real urban fabric that the gondola travels over. The third gondola compared is the only one that comes close to what Godfrey is trying to build and that is the urban gondola in Medellin, Columbia. This one is designed to take people from a poor section of town to the main transportation hub. Of course the gondola like Miami’s Metromover travels over city streets and does little for the urban fabric is passes over. The fourth project talked about once again is a poor comparison to Godfrey’s dream which is the Portland Ariel Tram. Like the telluride situation this gondola is designed to carry passengers from the waterfront area up a steep incline to the Oregon Health and Science University which is located on a cliff area to the west of the waterfront area. As a side note this does not replace a streetcar route but connects the Portland Streetcar to the University area. The line does travel along Gibbs Street which lies between the cliff and Interstate 5, but once again because the gondola travels over this isolated area, it is doing nothing to help this neighborhood. The next couple of gondola’s mentioned join Godfrey’s as pipe dreams which includes proposals in Baltimore, Maryland and Camden, New Jersey. What it comes down to is a gondola is good for point to point transportation especially for situations that involve huge elevation changes. What it is not designed to do is blend into the urban fabric of a community. How will 25th Street benefit from the Gondola? Instead imagine a streetcar traveling along the street bring people from FrontRunner to shop and dine in Ogden. What Godfrey should be working on is bringing a new vision to the city, one that focuses on the character of the city, provides the opportunity for independently owned retail stores and restaurants which would give residents of Salt Lake City an alternative to the chain stores and restaurants of Gateway and other developments. Ogden could build something really unique that would cause people to want to travel to the city. Between the river walk, 25th Street, and Washington Blvd Ogden has an outstanding opportunity to develop a unique destination that will bring new life to the city. Or will Godfrey take the opportunity that Ogden has and squander it on some pipe dream? Here is the videos that were produced for the former Southern California Rapid Transit District and the Los Angeles County Transportation Commission (which were merged to form the current Metro) when they were trying to bring trolley buses back to Los Angeles in 1991. Time to consider REAL Trolley Buses? With fuel prices going through the roof and the UTA having to consider a fuel surcharge due to those prices, is it time for transit systems such as the UTA to look at Trolley Buses again? Trolley buses have been around almost since the time of the first streetcar, although the became very popular in the 30's and 40's but like streetcars disappeared by the 60's due to cheap diesel prices. A few cities kept their Trolley buses including Vancouver, British Columbia; Edmonton, Alberta; Seattle, Washington; San Francisco, California; and Dayton, Ohio. Los Angeles looked into starting new trolley bus routes in 1992 and 1993 but NIMBY's in one corner of the route decided they did not want the trolley buses in their neighborhood due to the wires, despite the fact it would have eliminated diesel exhaust from their neighborhood. Otherwise except for a few extensions of the San Francisco and Seattle systems there has been little thought about the trolley bus. Besides NIMBYism, the other factor that kept new systems being put in was the initial capital cost and the higher price paid for trolley buses over standard buses. -First of all they are quiet when compared to standard buses. -Second, electrical components will last longer. 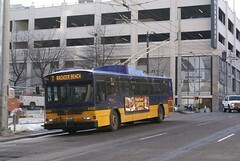 About 5 years ago Seattle replaced their 25 year old trolley buses. However, they did not replace them with entirely new vehicles. While the bodies on the buses were worn out, the electrical components only needed refurbishing. So their ordered new bus bodies from Gillig (shown in the picture) and refurbished the electrical components thus getting new buses for substantially less than a new bus. -Third, if a bus route has service of every 15-minutes or less trolley buses save money over diesel. Now that comes out of San Francisco with higher energy cost than Utah and back when diesel was down right cheap, so the cost savings would probably be even higher now. .
-Need to have off-wire capability for emergencies such as road closures and other events that would cause them to have to "leave the wire". Would Trolley Buses be more attractive to riders than standard diesel buses? They are quieter as noted so they actually could attract more riders but that cannot be quantified. Instead of spending money on Bus Rapid Transit, putting money into Trolley buses could be an alternative worth looking at especially on the many UTA routes that now run every 15-minutes.